The crowning glory of the Agra is the Taj Mahal, a monument of love and imagination, that represents India to the world. It is the most famous monument in Agra and one of the Seven Wonders of the World. This extravagant monument of love is one of the most visited and most photographed places in the world. Taj Mahal was built by Shah Jahan in the memory of his beautiful wife Mumtaz Mahal. Taj Mahal was the culmination point of Indo-Persian architecture. Regardless of whether you see it ethereally floating in the moonlight, blushing in the rosy glow of dawn or reflected in the pools of its gardens, it is enchanting. Perhaps the most moving view of the Taj Mahal is from a little octagonal tower in the Agra fort across the River Jamuna. It was here the Emperor Shah Jahan spent his last days in imprisonment, gazing at the tomb of his wife. Eighteen years after Shah Jahan became emperor, tragedy struck. Mumtaz Mahal, the beloved wife of Shah Jahan died at the age of 39 giving birth to her 14th child in 1630. The emperor went into mourning and vowed to built a sublime mausoleum in her memory, unlike any other in the world. 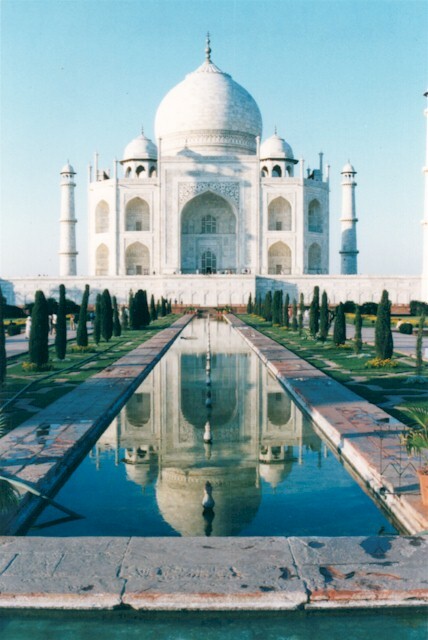 It was named the Taj Mahal, a peerless monument in pristine marble. About 20,000 labourers built this world renowned monument in about 22 years. The height of this lofty monument is 187 feet at the central dome. The material was brought in from all over India and central Asia. The Makrana Marble was brought from Rajasthan, Sandstone from Fatehpur Sikri, Jasper from Punjab, Jade and Crystal from China, Turquoise from Tibet, Lapez Lazuli and Sapphire from Bundelkhand, Onyx and Amethyst from Persia. The skilled artisans inlaid the white marble edifice with precious stones and conjured a lacy stone screen around the cenotaphs of the emperor and his beloved. 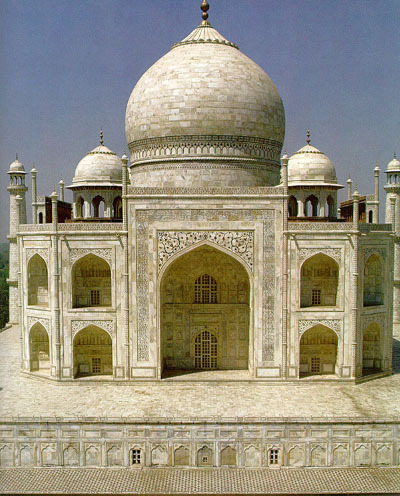 Ustad Isa Afandi was considered as the designer of the Taj Mahal. This monument was a symbol of Shah Jahan's eternal love for his wife Mumtaz Mahal. The main interesting places in Taj Mahal are the Jilo Khana at the main red sandstone entrance. The Jilo Khana is about 204 yards long and 150 yards wide.